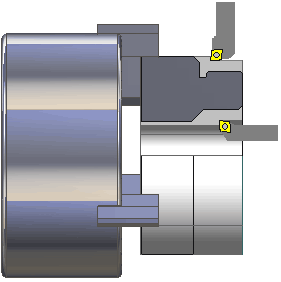 Lathe roughing operation is designed to get the intermediate part by removing a lot of the workpiece volume that is located outside of the part and fixtures. The tool removing is performed by the series of the parallel stroke. The strokes can be parallel or perpendicular or inclined to the revolution axis. The direction is assigned depends on the part shape. Set the <Overlap> strategy to get the semi-finished surface. It cuts the scallops, which remain between the strokes, and get the equal stock surface. Use the <Plunge> strategy to ignore the grooves if the tool does not designed for the plunge. The grooves can be machined by another tool in other operation. The step is one of the main parameters. The step value determines the tool path length and the machining time correspondingly, the tool load and the surface quality. The step reduction reduces the tool load but increases the machining time.